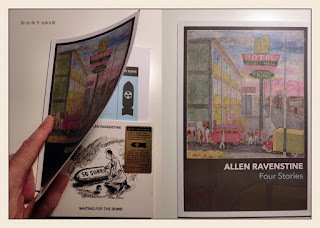 In edizione firmata e numerata è giunto ai sottoscrittori della primissima ora assieme allo splendido nuovo cd Waiting for the Bomb, alcune copie però sono disponibili anche singolarmente presso ReR Megacorp: Four Stories, di Allen Ravenstine. Così lo consiglia Cutler: "Slim, 44pp. perfect bound, paperback containing four stories. Illustrated by Mary Thomas. These four stories were written while Allen was working and touring with Pere Ubu, and speak directly of his experiences in those years. They waste no words - and the words used are meticulously chosen; I’m a fan. These are fine stories, artfully told. I’m not alone - Allen was one of those selected for The Penguin Book of Rock and Roll Writing in 1992. A small limited edition."